** NOTE: The game may take a few seconds to load in your browser. Thank you for your patience! 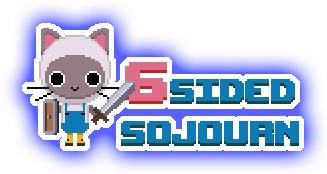 Help Gnocchi the cat explore a tiny roguelike planet, fighting monsters and collecting powerups along the way. Try to advance as many worlds as possible! Feel free to leave a comment telling us how far you got! Created in 72 hours for Ludum Dare 38 Jam. The theme was "A Small World". Click on a face of the planet to jump there or to perform an action. Click and drag the planet left and right to rotate. Tap on a face of the planet to jump there or to perform an action. Swipe the planet left and right to rotate. Died on lvl.70 from hitting the wrong key by mistake and getting one shot. Each round gets VERY long latter on but it doesn't get boring quickly, nor does the music get annoying so a very good game you can spend ages playing. If I were to recommend some things it would be to change the Info at the bottom about the squares, such as have it slide over instead of poping in and out and also a physical bar for health too and if it have a signal like the outline changing when you can one-shot something that would be helpful too. Oh my goodness! I LOVE THIS!!! One of the best Ludum Dare 38 games I've played so far! I could go further but stopped at World 44. Amazing graphics and gameplay.